Baklava is a rich, sweet pastry made of layers of filo filled with chopped nuts and spices which is then sweetened with syrup. Homemade baklava’s secret lies in the generous brushes of fresh butter, in its slow yet meticulous baking to make it crunchy and the rich syrup. Add all the syrup ingredients (sugar, water, lemon, zest) to a pot and bring mixture to a boil until it turns clear and sugar melts. Τest by pouring a couple of syrup drops on a plate and if they don’t ooze unless after a couple of seconds, the syrup is ready. Remove from heat and set aside to cool completely. Τest by pouring a couple of syrup drops on a plate and if they don’t ooze unless after a couple of seconds, the syrup is ready. Remove from heat and set aside to cool completely. Grind the nuts in a food processor until broken down but al dente. Add cinnamon and sugar and mix well. Start spreading the sheets of filo pastry, after separating them in two parts. Spread the first sheet letting half of it hang over the one edge of the baking dish and the other half covering the surface of the dish. Brush generously with melted butter throughout the surface and spread another sheet from the other side of the dish, accordingly. Spread the remaining sheets (of the first part) folded in half, making them fit exactly and nicely in the dish surface and brush them with melted butter. Once the sheets of the first part are over, sprinkle the processed almonds and walnuts, spreading them nicely. Fold the overhanging sheets of the filo over the filling (to seal) and brush with butter. Keep spreading the sheets of the second phase, always folded in half and finally brush the surface with the butter. Cut the baklava in diagonal, diamond-shaped pieces with a sharp knife. In case there is any leftover butter, pour it evenly over the baklava. Preheat the oven to 140oC, place on the middle rack and initially bake for 90’. (For the first 30’, cover with aluminum foil to prevent browning too quickly, and remove it for the remaining 60’.) After 90’, reduce the temperature to 120oC and bake for 60’, covering the dish with aluminum foil again. So, bake for 90’ to 140oC on the middle rack (30’ with + 60’ without foil) and 60’ to 120oC with the foil on. 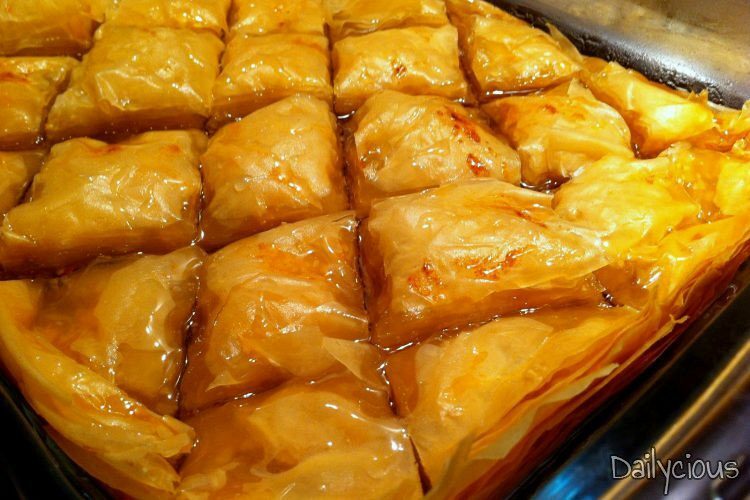 Remove from the oven and while still warm, spoon the syrup over the top of baklava to spread evenly. It is essential that the syrup is cooled while the baklava needs to be oven hot.